On my artist walks though Xizhou, I couldn’t help but admire the stacks of gorgeous blue and white textiles that dotted many of the sellers stalls. It reminded me of my days planning fiber art workshops with Shibori artist Yoshiko Wada. The blues range from a soft cloud blue, to deep indigo and are similar to the pool of layered blue hues that I am working with right now in my painting studio. I was trying to decide which tapestry to bring home with me, when I learned that Jeanee Linden at the LINDEN CENTRE made arrangements for a day trip to Zhoucheng Village, which is renowned for its Bai-tie dye cloth making tradition. The plan was for us to visit the Lanxu Eco-Culture Development Center and have the opportunity to make our own indigo handkerchief. I was beyond thrilled! Zhoucheng Village is nestled along the shores of Lake Erhai and is the largest intact Bai ethnic village in Yunnan. 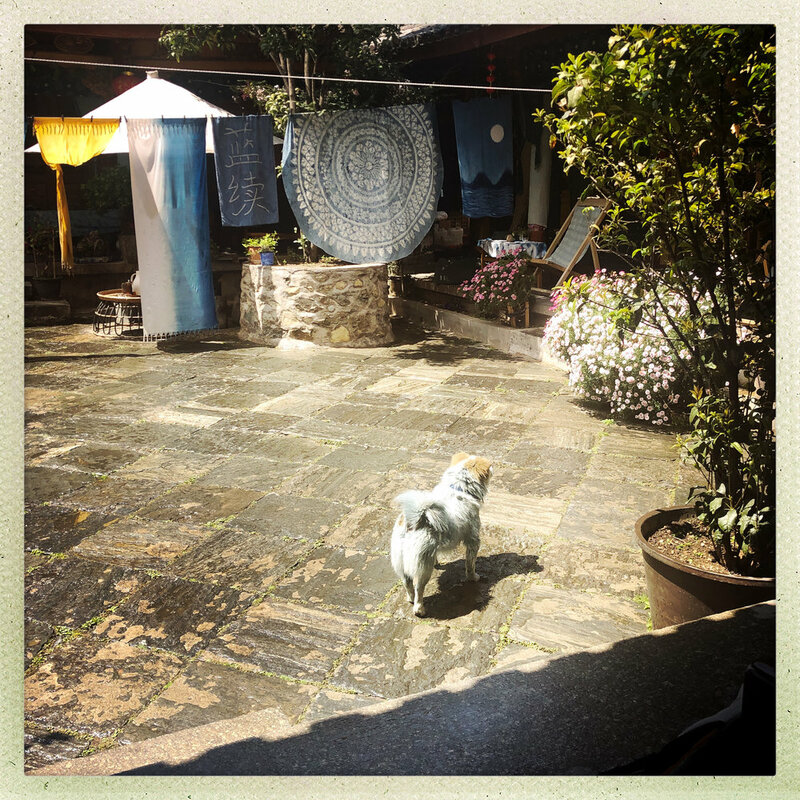 Our visit to Lanxu started with tea in the courtyard, while Jake explained the magic of Indigo to us, along with the other plant-based dyes that they use in their workshop. Jake also explained how to stitch patterns onto fabric, or how to fold it to create free-style patterns. I could hardly wait to get started. Since I am exploring circular themes in my photography right now, I wanted to try my hand at exploring those themes with my fiber art as well. I carefully stitched out my circles using a needle and thread as I was instructed to do. The thread line acts as a resist, so when I dip my pieces in the indigo, it only darkens the “right” spots. While I was stitching, we had a rain shower in the courtyard, which Jake called a “sun shower”. I loved the ambiance of where I sat with my work, watching the rain fall. When my stitching was done, I went back to the dye room, where I put on gloves and an apron and held my creations in large vats of indigo dye. Part of the process is gently moving the fabric in the dye vat, so your fabric will develop a nice even color. The indigo looks dark green and purple in color, and even has small bits of leaves floating in it. Jake explained that the indigo is boiled and then is allowed to sit for three years to get the rich color. When my handkerchiefs came out of the dye vat, we rinsed them and allowed the pieces to oxidize. It was magical to see how the color developed. My intention at the beginning of this day was to create a sun and moon pair, so I could share one with my daughter as soon as I got home. My designs came out exactly as I hoped. 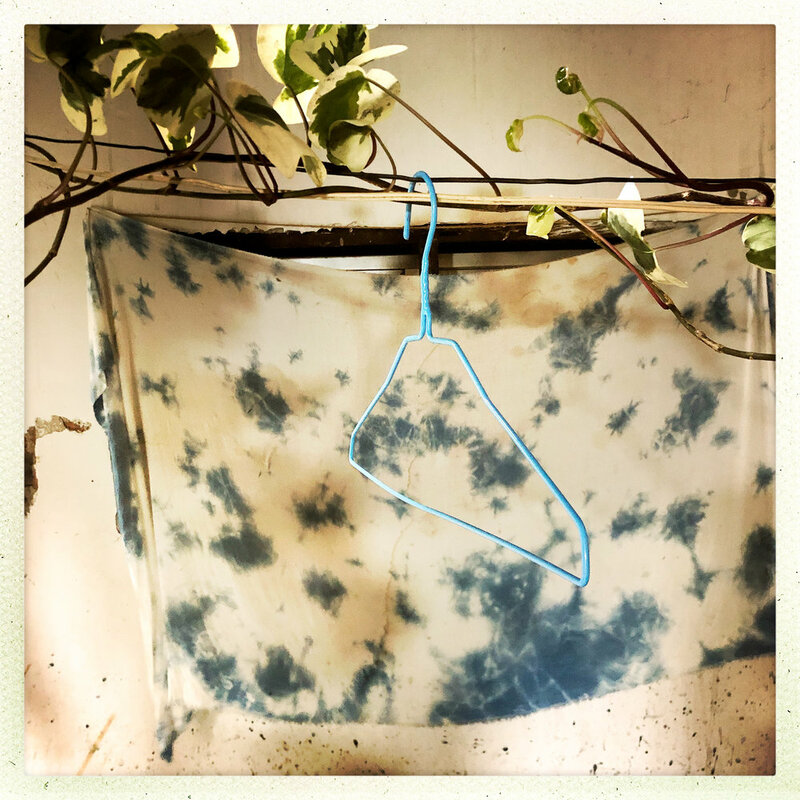 I would love to come back here, and organize a week-long workshop exploring the art of Bai-style tie dye, using indigo and natural dyes. If this sounds of interest to you, I invite you to join my mailing list so we can stay in touch! Be the first to know about our new travel destinations, retreats, blog posts, freebies and how-to guides for artists in need of a perfect getaway. Founder & Lead Travel Ambassador for OPEN AIR PLACES. I cant wait to share more with you soon about my travels along the ancient Tea and Horse Road in Yunnan. Artist’s inspiration is around every turn! Want to get social? Follow along with me on Instagram at @openairplaces or Facebook.